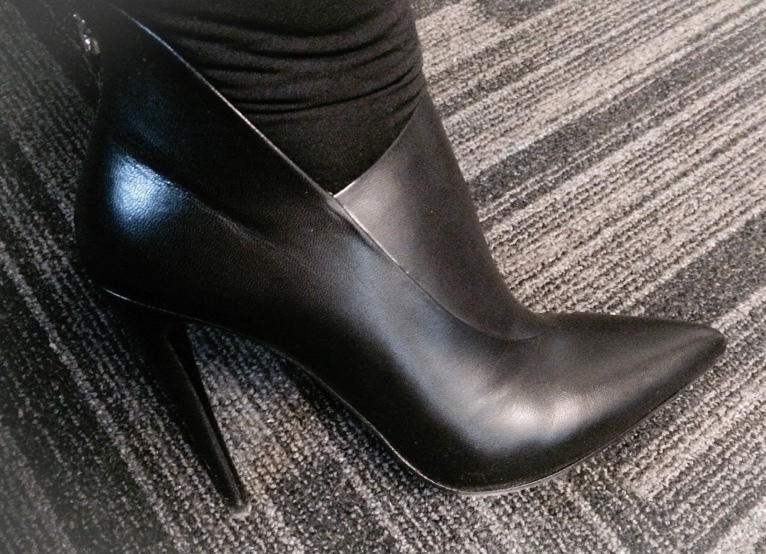 January | 2015 | Footwear Fashionista … a sneak peek into my shoe closet! Can you really ever have too many pointy toe booties in your shoe wardrobe? I think not! With this pair, it’s the subtle differences that make a big impact. 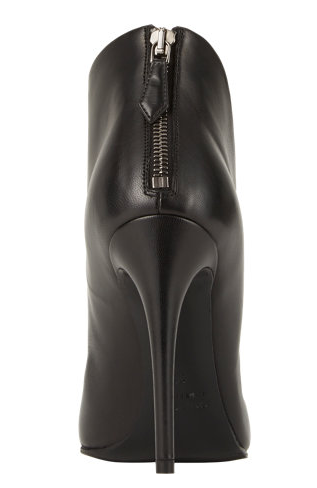 Miu Miu “pointed toe ankle bootie”. 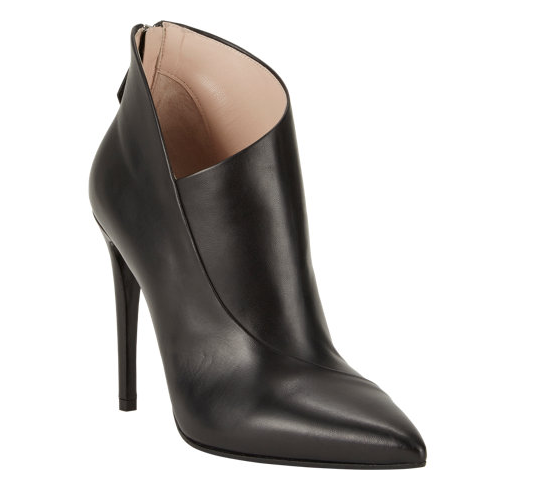 Smooth black leather with an asymmetrical topline that dips and aligns with a seam – a detail that is pure art. The 4.25″ stiletto heel has an exposed gunmetal-toned zipper. This minimalist bootie maximizes your wardrobe options. As I continue the closet clean up/purge, another pair have gone to a good home. 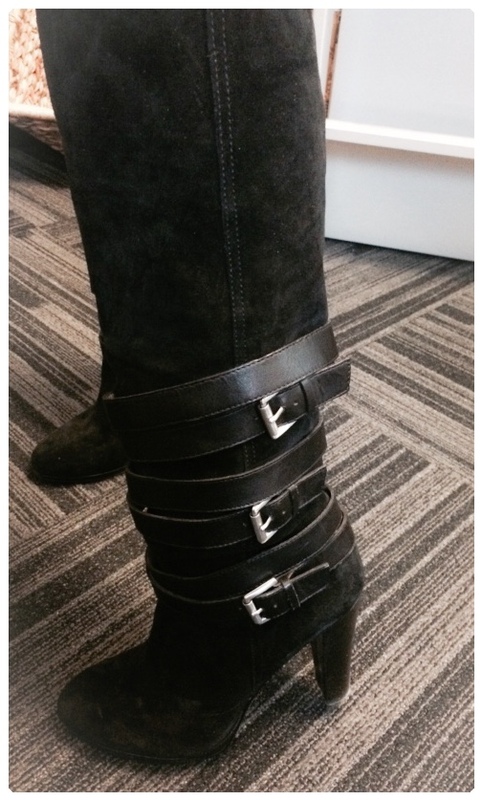 I recently gave this rockin’ pair of boots to my friend and co-worker Jessica. A black suede, pull on boot from Nine West with triple buckle leather straps that wrap the lower part of the boot. The 3.5″ wooden heel has a 1″ platform, allowing for a comfortable stride for her to strut her stuff. Looking good girl! Wear in good health. 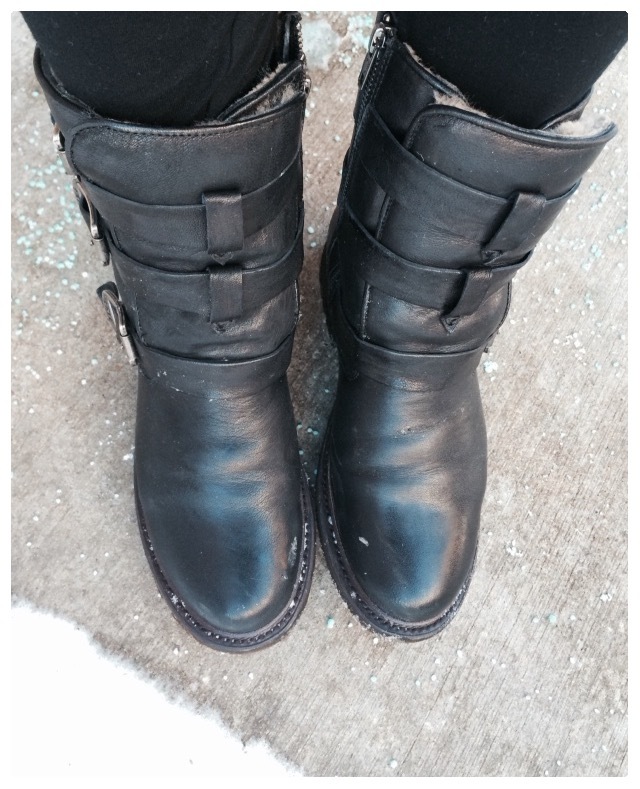 I ordered these fur lined boots for the midwest winters and was lucky to find them on sale. Prada’s mid length fur lined leather boot. I have to say, I am in love with these boots. I really am a Prada girl at heart. 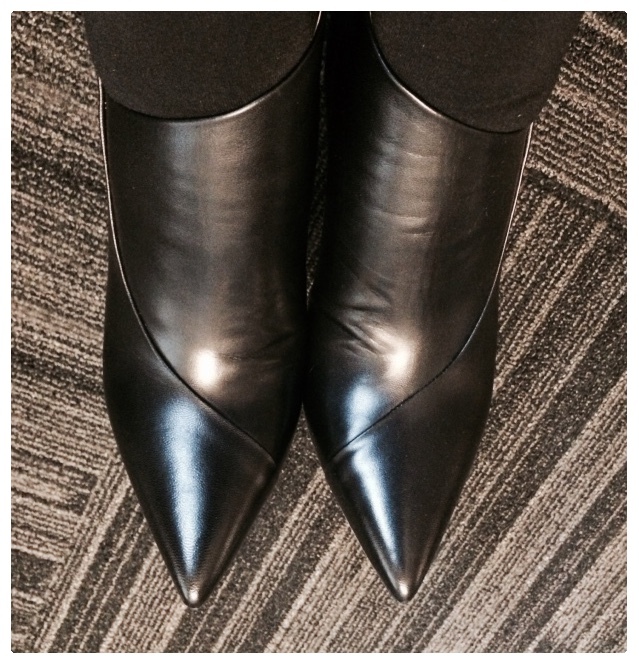 These boots are minimalist and incredibly stylish to boot. 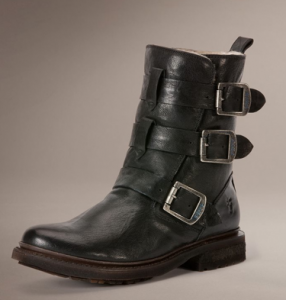 Ridiculously soft leather styled with a silver side buckle. 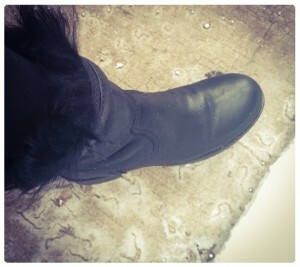 This pull on boot is lined with shearling fur – quite warm and more comfortable than I could have imagined. They sport a 2″ lugged heel with a 1″ platform and a rubber trek sole. What’s not to love? 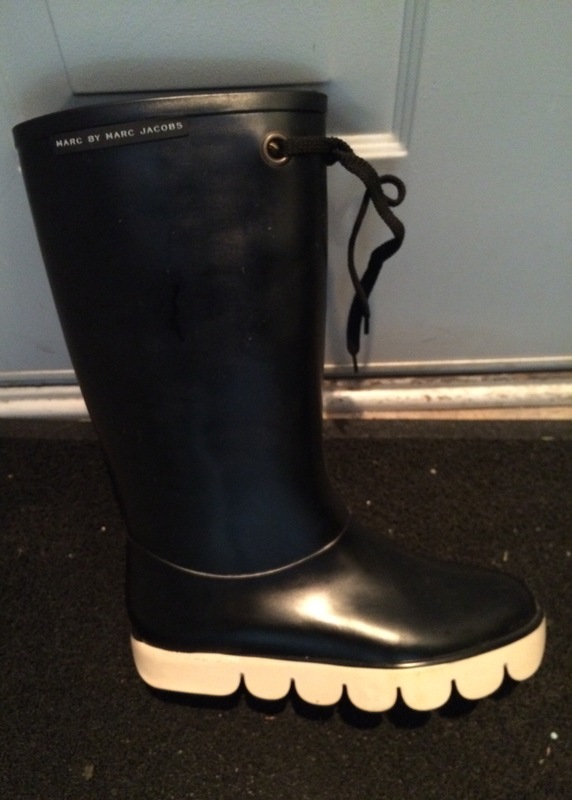 Random acts of kindness day….I was talking with a friend about rain boots. 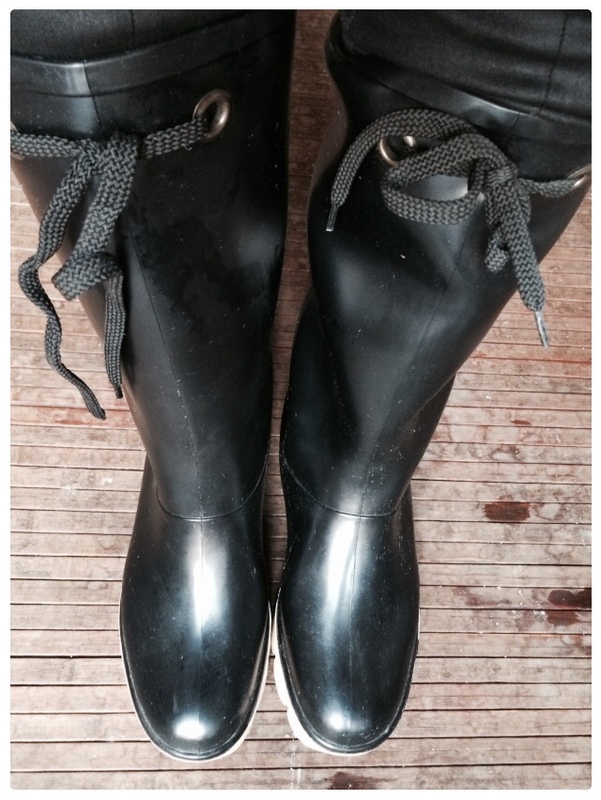 She mentioned how upset she was that her rain boots had deteriorated. She just so happened to be my size and I just so happened to have a pair (worn once) that was buried in a closet not being used. So today, these stylish Marc by Marc Jacobs rain boots have a new owner! 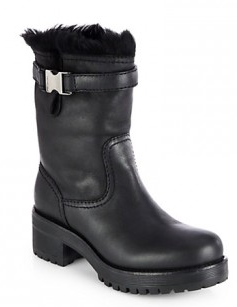 Black rubber outer boots with a contrasting off-white wavy sole and a tie top. Look out puddles! I have a confession. I haven’t been too happy with my Aquatalia boots. Although stylish, they aren’t cut out for the harsh midwest winters, particularly for standing around in arctic temperatures waiting for public transportation. Since the polar vortex has hit again with below zero wind chills, I decided I was in need of some seriously warm boots – stat. But I didn’t want to sacrifice style … so off to The Frye Company store I went. 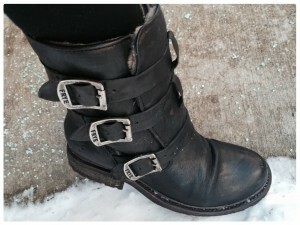 I narrowed the shearling-lined boots down to three styles and then finally decided upon the Frye “Valerie Strappy Shearling” boot. It’s so versatile and can be paired with leggings, jeans and skirts. Truth be told, I also purchased a pair of Prada fur-lined boots on line (and on sale), but they won’t arrive for another week and frostbitten feet are not an option. I have to say, I’m quite happy with my purchase, even if I did have to pay full price for the Frye’s. 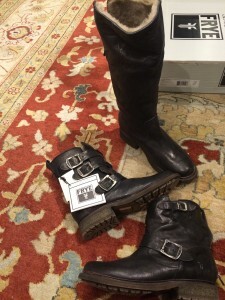 The boots are lined with Australian dyed lamb shearling, have a 1.5″ lug rubber heel to maneuver easily in snow, a round toe and oh-so-stylish triple buckles on the side vamp and they have an inner zipper. When you purchase from Frye’s website or store, you also are logged in their database and your purchase comes with a two-year warranty. 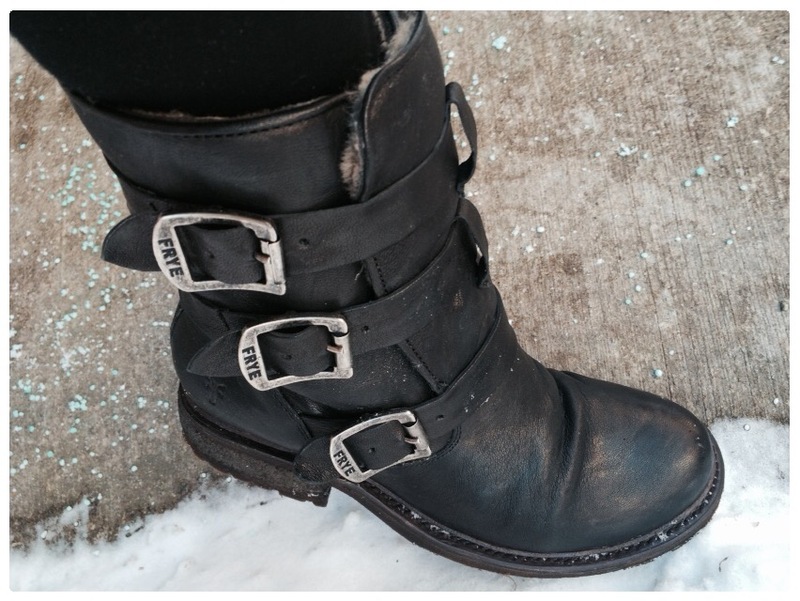 Stay warm and give winter the boot!